USA-North Korean relations remain very tense, although the threat of a new Korean War has thankfully receded. Still the U.S. government remains determined to tighten economic sanctions on North Korea and continues to plan for a military strike aimed at destroying the country’s nuclear infrastructure. And the North for its part has made it clear that it would respond to any attack with its own strikes against U.S. bases in the region and even the U.S. itself. This is not good, but it is important to realize that what is happening is not new. The U.S. began conducting war games with South Korean forces in 1976 and it was not long before those included simulated nuclear attacks against the North, and that was before North Korea had nuclear weapons. In 1994, President Bill Clinton was close to launching a military attack on North Korea with the aim of destroying its nuclear facilities. In 2002, President Bush talked about seizing North Korean ships as part of a blockade of the country, which is an act of war. In 2013, the U.S. conducted war games which involved planning for preemptive attacks on North Korean military targets and “decapitation” of the North Korean leadership and even a first strike nuclear attack. I don’t think we are on the verge of a new Korean war, but the cycle of belligerency and threat making on both sides is intensifying. And it is always possible that a miscalculation could in fact trigger a new war, with devastating consequences. The threat of war, perhaps a nuclear war, is nothing to play around with. 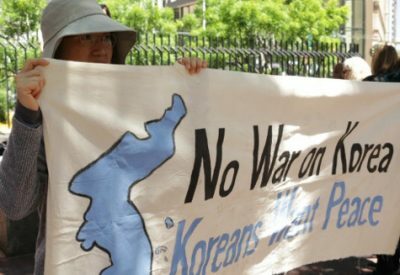 But – and this is important – even if a new war is averted, the ongoing embargo against North Korea and continual threats of war are themselves costly: they promote/legitimatize greater military spending and militarization more generally, at the expense of needed social programs, in Japan, China, the U.S., and the two Koreas. They also create a situation that compromises democratic possibilities in both South and North Korea and worsen already difficult economic conditions in North Korea. We don’t have to go down this road – we have another option – but it is one that the U.S. government is unwilling to consider, much less discuss. That option is for the U.S. to accept North Korean offers of direct negotiations between the two countries, with all issues on the table. (3) the North Korean leadership cannot be trusted to follow through on its promises. But none of this is true. First: if being a hermit kingdom means never wanting to negotiate, then North Korea is not a hermit kingdom. North Korea has been asking for direct talks with the United States since the early 1990s. The reason is simple: this is when the USSR ended and Russia and the former Soviet bloc countries in central Europe moved to adopt capitalism. The North was dependent on trade with these countries and their reorientation left the North Korean economy isolated and in crisis. The North Korean leadership decided that they had to break out of this isolation and connect the North Korean economy to the global economy, and this required normalization of relations with the United States. Since then, they have repeatedly asked for unconditional direct talks with the U.S. in hopes of securing an end to the Korean War and a peace treaty as a first step toward their desired normalization of relations, but have been repeatedly rebuffed. The U.S. has always put preconditions on those talks, preconditions that always change whenever the North has taken steps to meet them. The North has also tried to join the International Monetary Fund (IMF) and World Bank (WB), but the U.S. and Japan have blocked their membership. The North has also tried to set up free trade zones to attract foreign investment, but the U.S. and Japan have worked to block that investment. So, it is not the North that is refusing to talk or broaden its engagement with the global economy; it is the U.S. that seeks to keep North Korea isolated. Second: the media portray North Korea as pursuing an out of control militarism that is the main cause of the current dangerous situation. But it is important to recognize that South Korea has outspent North Korea on military spending every year since 1976. International agencies currently estimate that North Korean annual military spending is $4-billion while South Korean annual military spending is $40-billion. And then we have to add the U.S. military build-up. 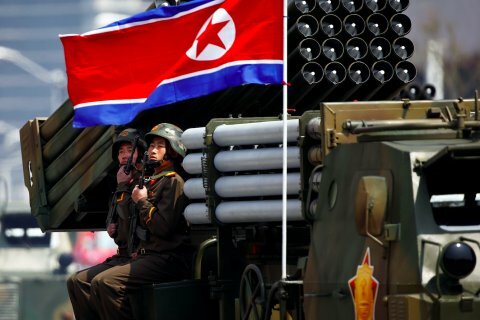 North Korea does spend a high percentage of its budget on the military, but that is because it has no reliable military ally and a weak economy. However, it has largely responded to South Korean and U.S. militarism and threats, not driven them. As for the development of a nuclear weapons program: it was the U.S. that brought nuclear weapons to the Korean peninsula. It did so in 1958 in violation of the Korean War armistice and threatened North Korea with nuclear attack years before the North even sought to develop nuclear weapons. Third: North Korea has been a more reliable negotiating partner than the USA. Here we have to take up the nuclear issue more directly. The North has tested a nuclear weapon 5 times: 2006, 2009, 2013, and twice in 2016. Critically, North Korean tests have largely been conducted in an effort to pull the U.S. into negotiations or fulfill past promises. And the country has made numerous offers to halt its testing and even freeze its nuclear weapons program if only the U.S. would agree to talks. North Korea was first accused of developing nuclear weapons in early 1990s. Its leadership refused to confirm or deny that the country had succeeded in manufacturing nuclear weapons but said that it would open up its facilities for inspection if the U.S. would enter talks to normalize relations. As noted above, the North was desperate, in the wake of the collapse of the USSR, to draw the U.S. into negotiations. In other words, it was ready to end the hostilities between the two countries. The U.S. government refused talks and began to mobilize for a strike on North Korean nuclear facilities. 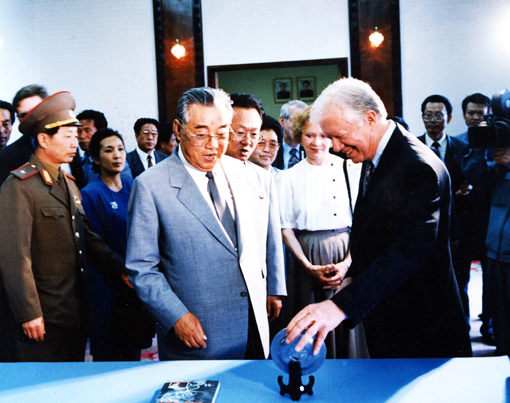 A war was averted only because Jimmy Carter, against the wishes of the Clinton administration, went to the North, met Kim Il Sung, and negotiated an agreement that froze the North Korean nuclear program. The North Korean government agreed to end their country’s nuclear weapons program in exchange for aid and normalization. And from 1994 to 2002 the North froze its plutonium program and had all nuclear fuel observed by international inspectors to assure the U.S. that it was not engaged in making any nuclear weapons. Unfortunately, the U.S. did not live up to its side of the bargain; it did not deliver the aid it promised or take meaningful steps toward normalization. In 2001 President Bush declared North Korea to be part of the axis of evil and the following year unilaterally canceled the agreement. In response, the North restarted its nuclear program. In 2003, the Chinese government, worried about growing tensions between the U.S. and North Korea, convened multiparty talks to bring the two countries back to negotiations. Finally, in 2005, under Chinese pressure, the U.S. agreed to a new agreement, in which each North Korean step toward ending its weapons program would be matched by a new U.S. step toward ending the embargo and normalizing relations. But exactly one day after signing the agreement, the U.S. asserted, without evidence, that North Korea was engaged in a program of counterfeiting U.S. dollars and tightened its sanctions policy against North Korea. The North Korean response was to test its first nuclear bomb in 2006. And shortly afterward, the U.S. agreed to drop its counterfeiting charge and comply with the agreement it had previously signed. In 2007 North Korea shut down its nuclear program and even began dismantling its nuclear facilities – but the U.S. again didn’t follow through on the terms of the agreement, falling behind on its promised aid and sanction reductions. In fact, the U.S. kept escalating its demands on North Korea, calling for an end to North Korea’s missile program and improvement in human rights in addition to the agreed upon steps to end North Korea’s nuclear weapons program. And so, frustrated, North Korea tested another nuclear weapon in 2009. And the U.S. responded by tightening sanctions. In 2012 the North launched two satellites. The first failed, the second succeeded. Before each launch the U.S. threatened to go to the UN and secure new sanctions on North Korea. But the North asserted its right to launch satellites and went ahead. After the December 2012 launch, the UN agreed to further sanctions and the North responded with its third nuclear test in 2013. This period marks a major change in North Korean policy. The North now changed its public stance: it declared itself a nuclear state – and announced that it was no longer willing to give up its nuclear weapons. However, the North Korean government made clear that it would freeze its nuclear weapons program if the U.S. would cancel its future war games. The U.S. refused and its March 2013 war games included practice runs of nuclear equipped bombers and planning for occupying North Korea. The North has therefore continued to test and develop its nuclear weapons capability. Here is the point: whenever the U.S. shows willingness to negotiate, the North responds. And when agreements are signed, it is the U.S. that has abandoned them. The North has pushed forward with its nuclear weapons program largely in an attempt to force the U.S. to seriously engage with the North because it believes that this program is its only bargaining chip. And it is desperate to end the U.S. embargo on its economy. We lost the opportunity to negotiate with a non-nuclear North Korea when we cut off negotiations in 2001, before the country had a nuclear arsenal. Things have changed. Now, the most we can reasonably expect is an agreement that freezes that arsenal. However, if relations between the two countries truly improve it may well be possible to achieve a non-nuclear Korean Peninsula, an outcome both countries profess to seek. So, why does the U.S. refuse direct negotiations and risk war? The most logical reason is that there are powerful forces opposing them. Sadly, the tension is useful to the U.S. military industrial complex, which needs enemies to support the ongoing build-up of the military budget. The tension also allows the U.S. military to maintain troops on the Asian mainland and forces in Japan. It also helps to isolate China and boost right-wing political tendencies in Japan and South Korea. And now, after decades of demonizing North Korea, it is difficult for the U.S. political establishment to change course. However, the outcome of the recent presidential election in South Korea might open possibilities to force a change in U.S. policy. Moon Jae-in, the winner, has repudiated the hard-line policies of his impeached predecessor Park Guen-Hye, and declared his commitment to re-engage with the North. The U.S. government was not happy about his victory, but it cannot easily ignore Moon’s call for a change in South Korean policy toward North Korea, especially since U.S. actions against the North are usually presented as necessary to protect South Korea. Thus, if Moon follows through on his promises, the U.S. may well be forced to moderate its own policy toward the North. What is clear is that we in the U.S. have a responsibility to become better educated about U.S. policy toward both Koreas, to support popular movements in South Korea that seek peaceful relations with North Korea and progress toward reunification, and to work for a U.S. policy that promotes the demilitarization and normalization of U.S.-North Korean relations. I discuss this history of U.S.-North Korean relations and current developments in South Korea in a May 8 interview on KBOO radio. To keep up on developments I encourage you to visit the following two websites: Korea Policy Institute and ZoominKorea. Martin Hart-Landsberg is Professor Emeritus of Economics at Lewis and Clark College, Portland, Oregon; and Adjunct Researcher at the Institute for Social Sciences, Gyeongsang National University, South Korea. His areas of teaching and research include political economy, economic development, international economics, and the political economy of East Asia. He is also a member of the Workers’ Rights Board (Portland, Oregon) and maintains a blog Reports from the Economic Front where this article first appeared.